This project is proving the most elusive I have undertaken so far. I have moved my ideas around quite a bit as I have tried things and they have not worked as well as I would have liked. This post sets out my latest thinking as a result of work I have recently undertaken. These portraits are interesting but I don’t think the achieve what I was aiming to do. I had to pinch myself and look back at my objectives. The aim of the work is to try to test the hypothesis that long exposures result in portraits which are ‘expressively cohesive’, which is the term used by Walter Benjamin in A Short History of Photography . Benjamin attributed this effect to the difficulty of self consciously posing during a long exposure. (Additionally, he seems to suggest that in the early days of the photography, portraits have this quality because the social conventions for photographic portraiture had not yet formed). By ‘expressively coherent’ I believe that he means that portraits made with long exposures would appear natural, with the subject appearing as others might normally expect to see them. This contrasts with snapshot photography where a range of different representations (expressions) of a given subject can be captured. As such the photographer/subject are able to manage (manipulate) how the subject is presented to the world. The problems with the Pinhole Portraits is that they are too expressive by design which confounds the very analysis I am trying to undertake. The soft focus of the pinhole lens gives the portraits an overtly psychological feel and the variations to the compositions raise questions I am not seeking to explore (to a great extent the compositions are arbitrary). It is also difficult to compare how my expression changes (or not) from one portrait to the next. So I think I need to change again. I have been researching the work of two photographers which are relevant to my work. The first is Bettina Von Zwehl who has experimented with different kinds of interventions with the subject. She has made several series including for example making a series of diptych portraits, with one image taken when the subject is breathing in and the second when breathing out. Von Zwehl’s approach is quite deadpan which I feel suits the experimental nature of the work. 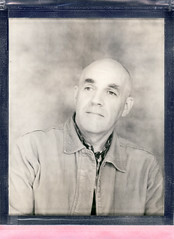 The second photographer is Eileen Perrier who has made several portrait series using large format cameras. Perrier has used a headstand to assist portrait subjects to remain in the same position during the exposures. I have been in email correspondence with Eileen trying to find out where she got the headstand. She was most helpful and I am now in making my own to use in this project. I have also agreed to be a subject in her next portraits series! I plan to post more comprehensive reviews of both Von Zwehl and Perrier shortly. 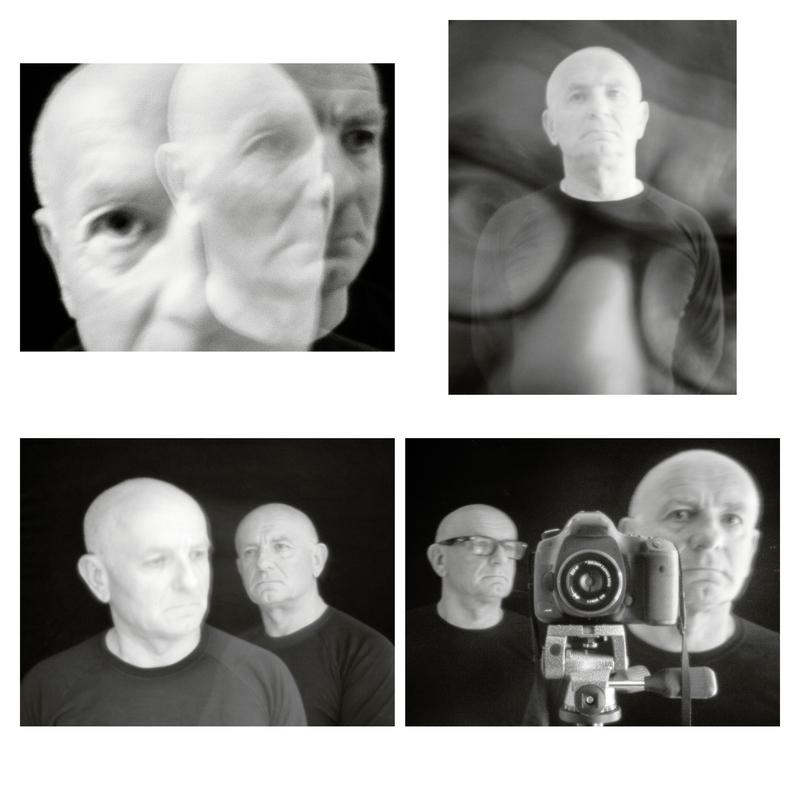 The upshot of this thinking is that I now plan to examine the ‘expressive cohesion’ of long exposure portraits by making a series of diptych portraits using my Rotary colleagues as subjects. 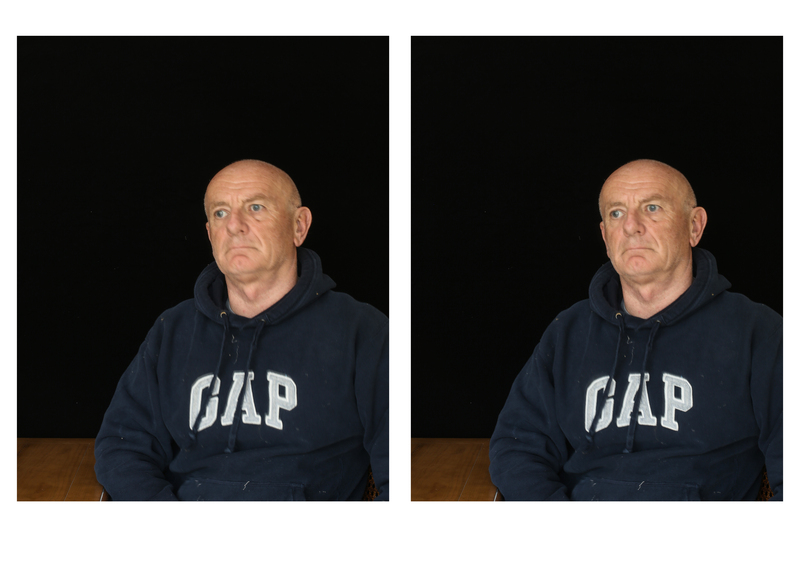 For both portraits in each diptych the subject will be in the same position and will have the same nature/direction of gaze. Each portrait however will be made with a separate long duration exposure. I aim to make these portraits in a plain style. The nature/direction of the gazes will be based on those in the David Octavius Hill portraits that I have already identified here . I will avoid overt theatricality to encourage the viewer to focus on the gazes. Indeed this is the aim. I want viewers to spend time with these portraits looking for similarities and differences in the expressions of the subjects. Here is an example using myself as the subject. Each was a 30 second exposure. I have made a mental note to ask my subjects to wear a dark plain top…the ‘Gap’ on my sweatshirt jars a little. Two very interesting photographers Keith. I’m really admiring the energy and exploration that you’re putting into this work. Yes they are interesting…Eileen has been very helpful..She has even been showing my ironman work to her students??? It has been a journey this project and I’m not sure I’m there yet but it feels like I’m getting close. I like the new aesthetic a lot – it works well as a follow-on from the Ironman series and I think it does offer more potential to explore the gaze. I wonder why this exploration interests you so much. What is it about disarming the gaze that speaks to you? Further to our chat at Brighton, I really do think you need to start submitting your work to galleries. Taylor Wedding next year perhaps? Thanks Eileen..I agree that the new aesthetic is much more consistent with my earlier work. I too am feeling much happier about it. As to why I am fascinated with disarming the gaze. I think that this may be a reaction against the highly aestheticised modes of portraiture one sees in the media (and even on the high street) these days…glamorous lighting, heavily retouched with everyone looking cute and manicured!! I want to show people as the genuinely appear to others. This is not of course a strategy which would yield me a large income from portrait sales!! Thanks for the compliment about submitting work for awards. Coincidently as I mention in the post I have been in email correspondence with photographer Eileen Perrier. I have been trying to find out where she got the headstand which she uses for some of her large format portraits. 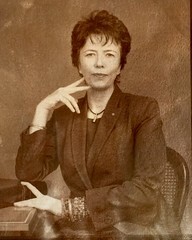 Eileen specialised in portraiture and has had many exhibitions at significant venues such as the Whitechapel Gallery. One of her portraits is on the front cover of Photography: A Critical Introduction by Liz Wells. To gain her interest I sent her the link to my ‘I am an Ironman’ video. She liked it and has even been showing it to her students!! She also said that I should submit my work to competitions such as Taylor Wessing…so you never know I might just do that next year.